“Marmosets’ tails are roughly twice as long as their bodies. 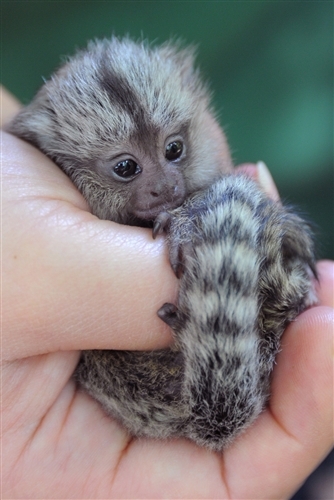 “The Marmosets /ˈmɑrmɵsɛt/ are 22 New World monkey species of the genera Callithrix, Cebuella, Callibella, and Mico. All four genera are part of the biological family Callitrichidae. The term marmoset is also used in reference to the Goeldi’s marmoset, Callimico goeldii, which is closely related. Most marmosets are about 20 centimetres (8 in) long. Relative to other monkeys, they show some apparently primitive features: they have claws rather than nails, and tactile hairs on their wrists. They lack wisdom teeth, and their brain layout seems to be relatively primitive. Their body temperature is unusually variable, changing by up to 4 °C (7 °F) in a day. Marmosets are native to South America and have been found in Bolivia, Brazil, Colombia, Ecuador, Paraguay and Peru. According to recent research, marmosets exhibit germline chimerism, which is not known to occur in nature in any other primate. Marmosets are highly active, living in the upper canopy of forest trees, and feeding on insects, fruit and leaves. They have long lower incisors, which allow them to chew holes in tree trunks and branches to harvest the gum inside; some species are specialised feeders on gum. The marmoset and other New World Monkeys are found in Central and South America. This entry was posted in Red Foxes (Animal Category) and tagged Central America, Marmosets, Monkeys, New World Monkeys, Primates, Red Foxes (Animal Category), South America. Bookmark the permalink.